The brave men and women of the San Diego Police Department put their lives on the line every day to protect our community. Thankfully, the majority of them return safely home to their families when their work is finished. For those who experience tragedy in the line of duty, the San Diego Police Officer Association (SDPOA) is there to provide both financial and community support to police officers and their families. A-1 Self Storage is honored by the opportunity to contribute to the Widows & Orphan Fund supporting the families of those officers who made the ultimate sacrifice while serving our community. The SDPOA was officially incorporated in 1953 as the San Diego Police Relief Association with the purpose of creating and maintaining a Police Relief Fund for the protection, care, and relief of its members experiencing distress in the form of injury, sickness, or death. The organization would later be renamed, but their mission to help aide officers in their time of need has continued. One of the most important parts of the SDPOA is the Widows & Orphans Fund. When a member of the SDPOA passes away, the Widows & Orphans Fund provides monetary support to the member’s beneficiaries. The fund is also available to officers who lose a spouse or child and acts not only as immediate support, but also as long-term support to those affected by loss. Without this organization, it is possible that these fallen heroes, and their families, would struggle with the financial cost of losing a loved one. We spoke with Detective Jack Schaeffer, President of the Peace Officers Research Association of California San Diego and Imperial Counties Chapter, about his experience with the Widows and Orphans Fund and what the SDPOA means to him. Ensuring that these officers and their families are well provided for in the event of tragedy is the main priority of the Widows and Orphans Fund and fundraising is a big part of making that happen. Jack noted that when it comes to raising money and putting on events, Anne Bosanac, SDPOA Fundraising Coordinator, has a gift for bringing the organization and its donors together. A-1 Self Storage is thankful to work with such a talented event planner and fundraising organizer like Anne. 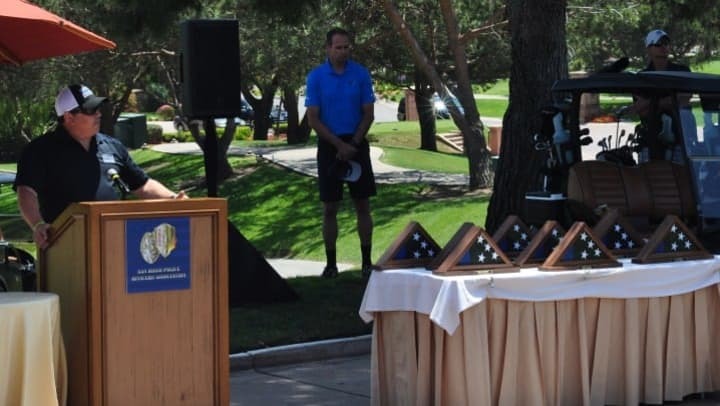 Our team is excited to work with her year-round, especially during the annual SDPOA Widows and Orphans Golf Tournament that takes place each summer. This event has become tradition for many in San Diego’s philanthropic community, because of its direct support for local law enforcement. Jack says that since Anne took over, she’s grow the annual golf tournament from a small gathering of friends into a community event taking place on the breathtaking greens of the Grand Del Mar Country Club. According to Anne, donations raised from this event have grown from around $14,000 in the first year to more than $300,000 this past year. It is now the SDPOA’s largest event. We at A-1 Self Storage want Jack and Anne to know that we are truly humbled by the work they do with the SDPOA Widows and Orphans Fund. Please consider making a charitable donation today or attending a future event.